Here we go to Brighton! Every year on a Sunday in mid-June thousands of people make the famous pilgrimage by bike from London to Brighton as part of a charity fundraising event. It's a great day out, and a chance for almost 30,000 riders of various abilities to challenge themselves on the 60-mile route from Clapham Common to Brighton seafront along country lanes and over the steep climb at Ditchling Beacon. Many club riders, as part of a wider training plan to ride cyclosportives challenge themselves to riding to Brighton and back in a day. So, the route to Brighton is a well travelled, and somewhat crowded road! For those who want to ride off-road there is a way too. It doesn't start right in the heart of London, but rest assured you won't be cheated out of your 60 miles! It is also traffic-free, and very scenic. In search of getting in some beach action over the Spring Bank Holiday I set out on my gravel bike on the off-road route to Brighton. I cheated a little by not starting in London, but instead took the train to Shalford, just outside Guildford and started my ride there. Within a mile of leaving the station I was on the Downs Link, a disused railway line that runs down to the coast at Shoreham-by-Sea. The route is generally well signposted, and goes through woodland, and many pretty villages where you can stop and go to a country pub or tea shop along the way. As well as that, there are picnic sites and benches for a little breather. One particularly nice place to stop is the disused railway station at West Grinstead where there are picnic benches and tables, plus an information centre set inside a disused train. Just like Bramley-and-Wonersh station earlier, West Grinstead also has the old platform, station house and signal box on show. 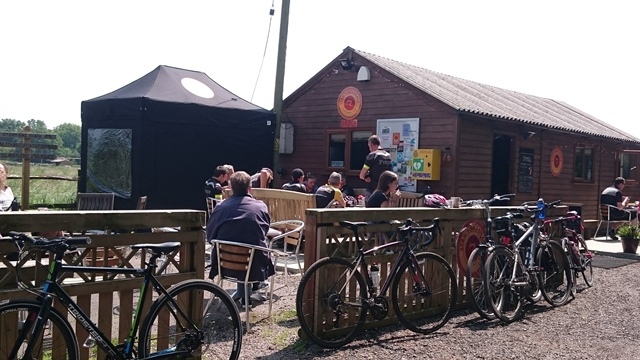 Further along, a cycle cafe at Partridge Green, Stan's Bike Shack is a great meeting point for off-road rider and roadie. It seems like every biker in Sussex turns up at this hang-out and swaps tales of their rides down to the coast so far. For those on the Downs Link it is mainly a tale of pretty flowers, beautiful views, woodland birds and no steep climbs (apart from a short sharp shock at Rudgwick). 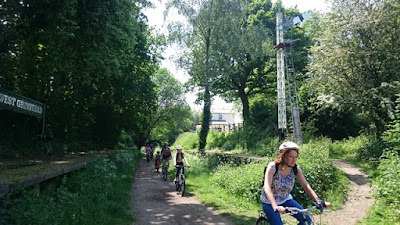 Some, particularly those out on family rides (of which there are many) may find this route a dream as it is scenic and has no technical challenges. Whereas those who have turned up on full suspension mountain bikes may find they are a little overequipped for this route which lacks any steep climbs, descents or technical single track to get into. Starting the Downs Link at St Martha's Hill, with it's steep climb and a tricky descent through sand may address the issue of a lack of anything testing. After that, it's a case of hang on until Bramber, three-quarters of the way along the Downs Link. At this point the Downs Link crosses the South Downs Way, and there, a world of technical challenges opens up! Keen to throw in a bit of something technical, I decided to treat myself to a bit of South Downs Way. It would have been rude not to include some of this beautiful chalky ridge into my ride, even if I was just on my rigid gravel bike. Beforehand, I stopped off to get some sustenance at Bramber, a very pretty village with picturesque castle ruins and olde worlde cottages. Soon afterwards, I was at the foot of the first serious climb onto the South Downs, grinding my way up to Trudleigh Hill along with a few guys on mountain bikes who started the climb at the same time as me. There we all were, honking our way up the trail which was dry, rutted, full of stones and bumps, and with an unspeakable gradient! One guy in front of me dismounted for a breather. As he was in my way, I had to do the same - but frankly, it was a welcome breather! I waited for him to get his breath back and restart the climb, so we both climbed up together - except that he ended up dismounting again, a few yards later. This time I wasn't going to stop, and so continued on, huffing and panting so loudly it made him jump when he turned around and saw me. Thankfully, he ducked out of the way to let me pass through, as I didn't have the breath to say "on your right". 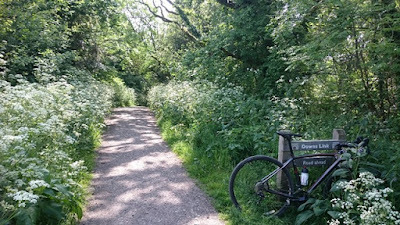 I really had to wrestle my bike into a straight line and keep up the momentum on this relentlessly steep path, which at times made my back wheel spin. With my nose on the handlebars, I was determined to keep going and not put my foot to the ground until the summit. The mountain biker's friend, who was further ahead, was also determined to keep going as he twiddled his way up the climb with his low mountain bike gears - also panting and huffing. I caught him, and hung onto his wheel, hoping he wouldn't bail out and cause me to stop. Luckily he carried on to the summit, and the road went from excruciatingly tough to manageably steep, allowing us both to heave a big sigh as we got the worst part of the climb out of the way. Then I waved goodbye to him as he stopped to wait for his friends. I felt thankful that this guy had kept me going on this challenge, and felt quietly impressed with myself that I had managed it on my gravel bike. When I had initially seen these mountain bikers at the water point at the foot of the Trudleigh climb they greeted me, though looked at me almost quizzically on my gravel bike as if to say "Are you sure you want to ride the South Downs Way on that? The Downs Link is back the other way, you know!" So it was ironic that I managed to outride these fully kitted up mountain biker blokes with gears a lot lower than mine. Having successfully crested Trudleigh Hill on my gravel bike I felt emboldened about riding other climbs along the South Downs Way - as long as they didn't come too rapidly in succession! So I got through Edburton Hill and onwards to Devil's Dyke, which were slightly easier hills to do. 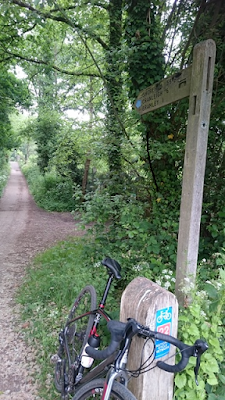 The vast majority of riders out on the South Downs Way were on mountain bikes, though I did see three or four people on cyclo cross bikes and we acknowledged each other like we were special kindred hardy spirits in a world of wussy full sussers! I must say the vistas across the South Downs were beautiful, and it's always lovely to be up on the peacefulness of the hills while having a view of the sea way over in the distance. My trip across the South Downs was limited in the end, as I was keen to get down to the seaside and soak in some Sunday afternoon sunshine. I therefore turned off the South Downs Way after the Fulking climb and dropped down to Southwick via the Sussex Border Path, another rather scenic trail. The hardest part of riding the South Downs Way on a rigid bike is all the bumps, particularly when going downhill. 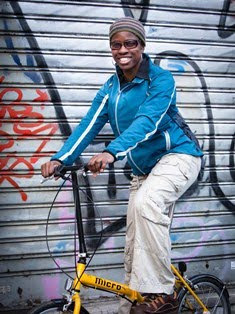 It's better to go down with minimal braking, as the bike floats along the tops of the bumps. However, too much speed would cause me to lose control and either crash, or I would hit a hole and cause the bike to break a spoke. So I had to brake a little bit - the problem then is even fractionally too much braking would mean a massive lot of jolting and a "headbanging" experience! Once on the seafront I had a big smile on my face as I got tantalisingly close to Brighton, rejoining the riders who had just come off the Downs Link. 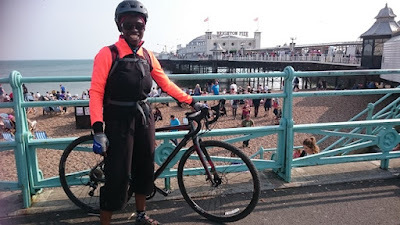 We rode along National Cycle Network route 2 via Shoreham Harbour to reach Brighton Pier, feeling pleased with our respective rides, and finally knowing that we had made it to that place in the sun. It was great to be at my favourite weekend hang-out, Brighton. It has such a trendy feel about it just like the cool parts of London, except that you have this lovely coastline to go with it and there is laid-back relaxed atmosphere. 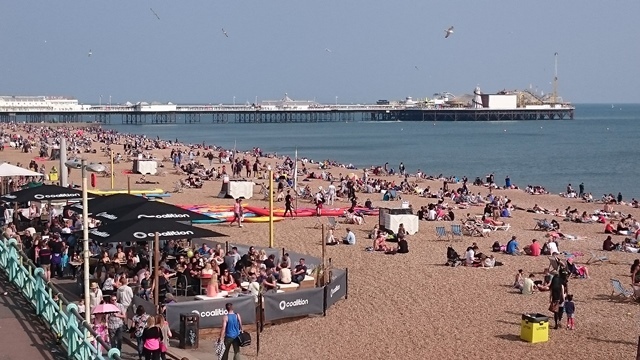 In fact, a lot of people who work in London actually live in Brighton. I know, because I see them whenever I catch the packed Thameslink train into work! And then there are folks like me who live in London and like to go to Brighton at every spare moment. I look forward to meeting a genuine Brighton person who lives and works in Brighton! An off-road bike-ride down to the coast is highly recommended. You can make it as easy or as tough as you like. The Downs Link would earn you a plate of chips, adding in one climb of the South Downs Way earns you fish and chips, but getting as far as Plumpton, especially on a cyclo cross/gravel bike definitely deserves the Full Monty! I hope to do that next time. Why go to the Amalfi coast?